In just two days you can discover beautiful scenery, boutique wineries, craft breweries, local museums, Native American history, and other great spots in Southwest Washington on the Wine and Heritage Trail! With many established wineries in the area, and more starting up each year, Clark County is increasingly becoming known as Washington’s burgeoning wine region. Be sure to check out our wineries page to see what each one has to offer! Located in Yacolt, this historic farm depicts agrarian life as it was in the 1920s. Special events throughout the year include themed teas, the Herb and Garden Festival, and Pumpkin Lane in October. Don&apos;t forget to stop by Pomeroy Cellars for a wine tasting. This 387-acre park is located just northeast of Battle Ground and features two waterfalls as well as a picturesque arch bridge standing over three stories high. The more than two miles of trails also makes this park a hiker’s paradise! 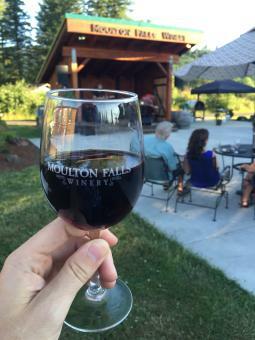 Reward yourself post-hike with a visit to Moulton Falls Winery. This old-fashioned steam train once hauled logs to Columbia River ports, but now provides scenic rides throughout the year. The 10-mile round-trip takes passengers through the Lewis River Valley, stopping at Moulton Falls and offering a cliffside vantage point of the Lewis River. Housed in the historic 1910 United Brethren Church in Amboy, this museum preserves Native American, settler, and logging history of the region. Built in 1876 and still open year-round on weekends, the Cedar Creek Grist Mill gives visitors the chance to partake in a “working tour,” showcasing how the mill produces flour, corn meal, and apple cider. Located on the Ridgefield National Wildlife Refuge, this full-scale replica of a Native American cedar plankhouse on a Lewis and Clark historical site depicts the culture and habitat of this area’s original inhabitants. Nearby wineries include Stavalaura Vineyard and Windy Hills Winery. One can easily spend an entire day exploring the Fort Vancouver National Historic Site and all of its elements, including Officers Row, Pearson Air Museum, the Parade Grounds, the reconstructed Fort, and so much more!